Singing has numerous benefits for young children. It encourages them to express their emotions. It helps them develop verbal skills. It builds confidence and creativity. Additionally, songs help children better retain information like the alphabet, numbers, and vocabulary. Singing also teaches children muscle memory and makes them practice their verbal skills. If you want to encourage your child to sing, a karaoke machine is one of the best ways to do it. They can sing along with their favorite songs. They will love it because the microphone will make them feel like a rock star. A karaoke machine is something that will definitely be put to use if you have toddlers in the house. But which karaoke machine is the best karaoke machine for kids? Children of different ages have different needs when it comes to karaoke machines. Small children don’t have much use for the lyrics, as they can’t read. This frees the machine from being plugged into a screen. Without being tethered to a screen, the machine should be able to run on batteries. It should also be lightweight and portable so your kids can carry it around and dance while they sing. The biggest difference in karaoke machines for small children and older people is volume. Young children don’t need much volume to be happy. They’ll be happy singing into a hairbrush. But you will benefit from a machine that doesn’t get too loud. And the controls should be simple enough for small children. Lastly, it should be durable. Your kids will dance and run around and are too young to understand the fragility of electronics. The Sing-Along Portable 2 Microphone Player is definitely designed with toddlers in mind. It is brightly colored and inviting for young children. The buttons are few and easy to operate. It comes with two microphones for sharing. They cannot be detached and lost. It is battery powered but also has a plug option if you are ever out of batteries. It is lightweight and durable. The Sing-Along Portable 2 Microphone Player is capable of streaming music from several sources. You can connect it to your phone through Bluetooth. Then the kids can skip through the songs on the machine, so they don’t have to touch your phone at all. If you have older devices, they can connect through USB or auxiliary cable. For the easiest option, it also has a built-in FM radio that requires no other device. So how much will your kid really like the Sing-Along Portable 2 Microphone Player? Well, for the most part, it’s pretty easy to use. The buttons are large and clear. The colors are bright and fun. A downside is that the initial set-up is a little too difficult for young children. They won't be able to navigate the Bluetooth. Before they begin singing, you will definitely have to help them out. Also, if your kids want to sing specific songs, you’ll have to set them up on your device every time. This isn't a problem if you're going to be playing with them. But if they want to play while you're busy, you should set up a playlist with kiddie songs for them to skip through. This machine gets loud enough to please the kids, but not too loud to upset the neighbors. The sound quality isn’t that great but kids won’t really mind at that age. It won’t satisfy kids above the age of six or seven because it doesn’t offer an option to display lyrics. Once your kids get older they’ll want something a bit more advanced. If you have children of various ages, this may not make your older children happy. There are better devices on the market for family entertainment. The machine is small enough and light enough for your kids to tote it around with them. They can bring it in the car or to a friend’s house easily. It is pretty durable, so it should last through plenty of bumps and scrapes. A nice addition to the design would be a rechargeable battery. As it is currently, it runs off of four “AA” batteries. It can run off of a power adapter, but one is not included. So you’ll have to search for one or continue to replace the batteries. The microphone cords are nicely designed. They curl up to prevent tangling. They are not very long, though. This can be troublesome if you have two kids singing into them who want to dance around. Longer retractable cords would be a better design. 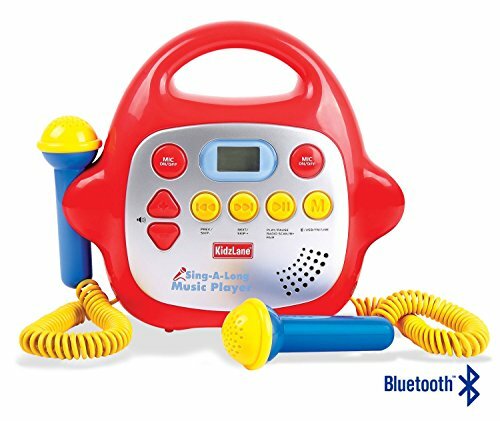 Overall, this is a perfect karaoke machine for toddlers. It addresses kids’ needs without too many frills that could complicate things. For older children or family fun, this might not be the best. But your little ones should enjoy this for years.